We have previously reported on purification and characterization of β-fructofuranosidase (β-FFase) from Bifidobacterium adolescentis G1. This enzyme showed high activity of hydrolysis on fructo-oligosaccharides with a low degree of polymerization. Recently, genome sequences of B. longum NCC2705 and B. adolescentis ATCC 15703 were determined, and cscA gene in the both genome sequences encoding β-FFase was predicted. Here, cloning of cscA gene encoding putative β-FFase from B. adolescentis G1, its expression in E. coli and properties of the recombinant protein are described. Using the information of cscA gene from Bifidobacterium adolescentis ATCC 15703, cscA gene from B. adolescentis G1 was cloned and sequenced. 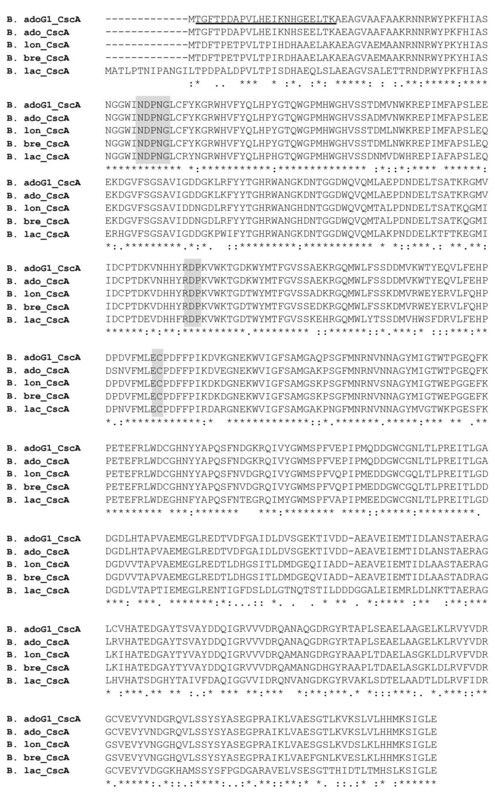 The N-terminal amino acid sequence of purified β-FFase from B. adolescentis G1 was identical to the deduced amino acid sequences of cscA gene from B. adolescentis G1. To confirm the translated product of the cscA gene, the recombinant protein was expressed in Escherichia coli. Molecular mass of the purified recombinant enzyme was estimated to be about 66,000 by SDS-PAGE and 60,300 by MALDI TOF-MS. The optimum pH of the enzyme was 5.7 and the enzyme was stable at pH 5.0-8.6. 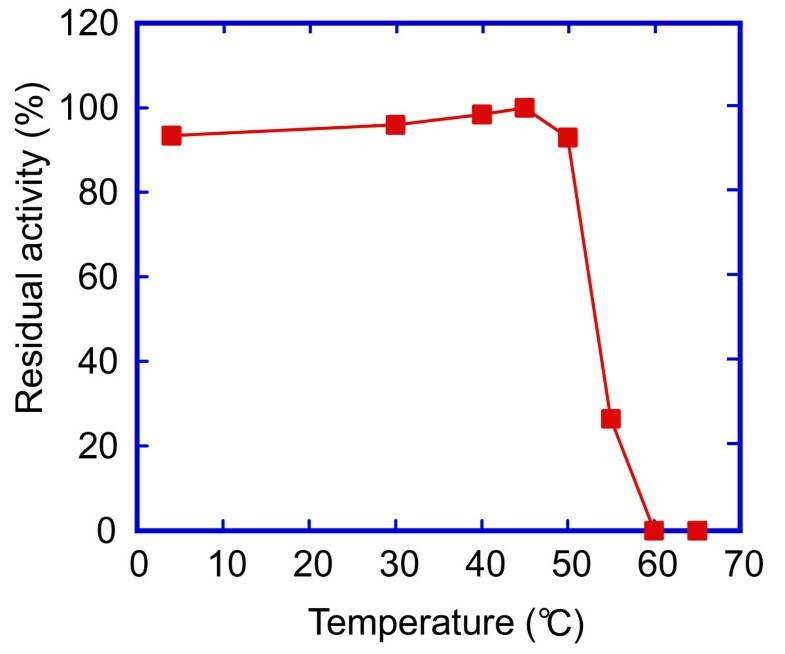 The thermostability of the enzyme was up to 50°C. The Km (mM), Vmax (μmol/mg of protein/min), k0 (sec-1) and k0/Km(mM-1 sec-1) for 1-kestose, neokestose, nystose, fructosylnystose, sucrose and inulin were 1.7, 107, 107.5, 63.2, and 1.7, 142, 142.7, 83.9, and 3.9, 152, 152.8, 39.2, and 2.2, 75, 75.4, 34.3, and 38, 79, 79.4, 2.1, and 25.9, 77, 77.4, 3.0, respectively. The hydrolytic activity was strongly inhibited by AgNO3, SDS, and HgCl2. The recombinant enzyme had similar specificity to the native enzyme, high affinity for 1-kestose, and low affinity for sucrose and inulin, although properties of the recombinant enzyme showed slight difference from those of the native one previously described. Bifidobacteria are saccharolytic anaerobes generally present in human intestine. Growth of bifidobacteria is selectively promoted by prebiotics . Fructo-oligosaccharides, such as 1-kestose, nystose and fructosylnystose, consist of β-2,1-linked fructose to sucrose, and they are naturally contained in artichoke tubers , chicory roots  and burdock roots [4, 5]. These saccharides have been produced and commercially manufactured from sucrose with bacterial fructosyltransferase  and β-fructofuransidases (β-FFases) [7–9], and have been on the market as prebiotics. Fructo-oligosaccharides are not hydrolyzed by digestive enzymes of mammalian origin, so they are able to reach large intestine, and to be selectively degraded by the resident microbes, such as bifidobacteria. We have already reported that B. adolescentis G1 were isolated from feces of human adults, and produce the unique β-FFase which has high affinity toward 1-kestose, nystose and fructosylnystose [10–12]. Recently, genome sequences of B. longum NCC2705 (accession no. AE014295) and B. adolescentis ATCC 15703 (AP009256) were determined, and cscA gene in the both genome sequences encoding β-FFase was predicted . The recombinant β-FFase from B. infantis , B. lactis  and B. longum  have been studied using mixtures of fructo-oligosaccharides (Actilight, Raftilose and Raftiline) as a substrate, although detailed substrate specificity of the enzyme to sole fructo-oligosaccharide remains unclear. In our previous study purification and the substrate specificity of β-FFase from B. adolescentis G1 was demonstrated [10, 11]. However, we have not revealed the gene encoding β-FFase from B. adolescentis G1 yet. This study is aimed at cloning of cscA gene from B. adolescentis G1 and characterizing the recombinant protein of cscA gene expressed in Escherichia coli. The open reading frame (ORF) of cscA gene from B. adolescentis G1 consisted of 1,557 nucleotides which encoded a 518 amino acid polypeptide. The molecular mass and pI of the deduced polypeptide were predicted to be 58,119 and 4.89, respectively. N-terminal sequence of purified enzyme was found in the deduced polypeptide. The deduced polypeptide of cscA gene from B. adolescentis G1 shows high identity that from bifidobacteria (B. adolescentis ATCC15703 [accession no. AP009256, protein ID BAF39931]: 98%, B. longum NCC2705 [accession no. AE014295, protein ID AAN23970]: 85%, B. breve UCC2003 [accession no. AY549965, protein ID AAT28190]: 84%, B. animalis subsp. lactis DSM10140 [accession no. AY509036, protein ID AAS87041]: 72%) (Fig. 1). Deduced polypeptides of cscA gene from B. adolescentis G1 belong to GH family 32, and confirmed existence of NDPNG motif and EC motif involved in catalysis. Two acidic residues have been identified as being related in the catalytic mechanism of yeast invertase: Asp-23 as a nucleophile and Glu-204 as an acid/base catalyst [17, 18]. Asp within NDPNG motif and Glu within EC motif were significant part of β-FFase from B. adolescentis G1 (position of NDPNG: Asn-53-Gly-57, EC: Glu-235-Cys-236). Additionally, Asp-309 within RDP motif was investigated on Acetobacter diazotrophicus levansucrase, the motif was found at a conserved position, not only in levanases but also in invertase . The Asp (D) in RDP motif in levansucrase from Bacillus subtilius was identified as a transition state stabilizer . The exsistence of the motif was likely to keep a common functional role for β-FFase. It seems that the motif was also important portion for β-FFase from B. adolescentis G1 (position of RDP: Arg-180-Pro-182). The motifs are in highly conserved position in β-fructofuranosidase of GH32 . Deduced amino acid sequence of cscA from Bifidobacterium. B.adoG1_CscA, deduced amino acid sequence of cscA gene from B. adolescentis G1; B.ado_CscA, B. adolescentis ATCC 15703 (A1A2J8); B.lon_CscA, B. longum NCC2705 (Q8CY57); B.bre_CscA, B. breve UCC 2003 (3115295E); B.lac_CscA, B. lactis (Q564C7) are aligned. The three carboxylic acids in NDPNG, RDP and EC motifs are crucial for enzyme activity are shaded in gray. Underlined sequences indicate the N-terminus of purified β-FFase from B. adolescentis G1. Consensus line: asterisks (*) indicated identical residues; colons (:) indicated conserved substitutions; and periods (.) indicated semi-conserved substitutions. To investigate translated product of cscA gene from B. adolescentis G1 in detail, recombinant protein was produced by E. coli Rosetta2 (DE3) with pET-G1cscA. 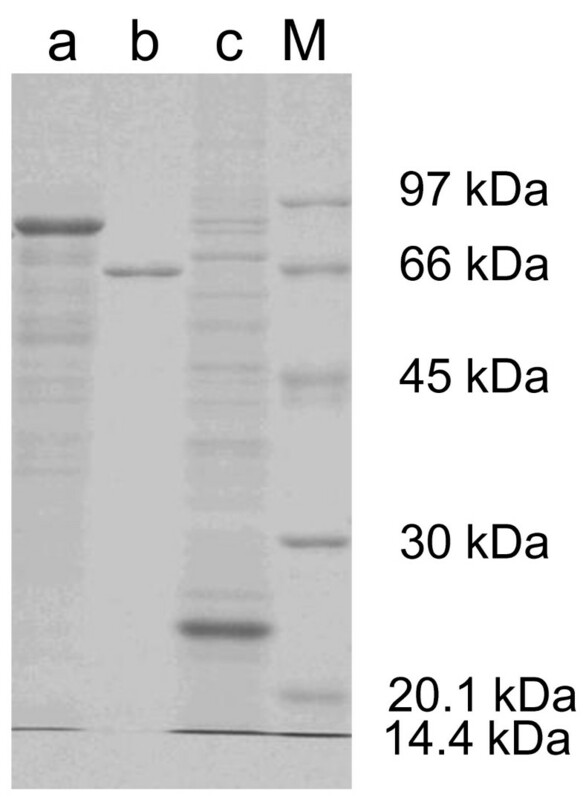 The recombinant protein was confirmed in cell extract by SDS-PAGE and enzyme assay. The recombinant protein was purified from cell extract (total protein 163 mg, total enzyme activity 1,480 U, specific activity 9.1 U/mg) (Fig. 2(a)) by TALON CellThru Resin, DEAE Sepharose CL-6B, Toyopearl HW-55S. Purification procedures of recombinant protein were summarized in Table 1. Specific activity of the final purified enzyme was 86.0 U/mg. SDS-PAGE analysis of the purified enzyme showed a single band with an apparent molecular mass of about 66,000 (Fig. 2(b)). MALDI-TOF mass spectrum of purified recombinant protein shows a mass-peak at near 60,300, in agreement with the calculated mass of recombinant protein including extra sequences from pET32b (+) vector (data not shown). The reason of difference between calculated mass and actual measurement mass by SDS-PAGE is not clear. However, Shirai et al reported that acidic proteins (those for which isoelectric points are less than 6.0) exhibited mobility smaller than calculated, this may be due to negative charge repulsion with SDS . In case of our study, the smaller mobility of recombinant protein (Fig. 2) than the mobility from calculated mass might be thought by the same reason. SDS-PAGE of recombinant protein. SDS-PAGE was conducted on a 12.5% (v/w) polyacrylamide gel, and gel was stained with CBB. Lane a: crude extract of E. coli Rosetta2 (DE3) harboring pET-G1cscA (135.8 μg of protein), Lane b: purified recombinant protein (2 μg of protein), Lane c: crude extract of E. coli Rosetta2 (DE3) harboring empty vector (65.3 μg of protein), Lane M: molecular mass marker proteins. Summary of purification procedure recombinant β-FFase. The effects of pH on hydrolytic activities toward 1-kestose were examined. 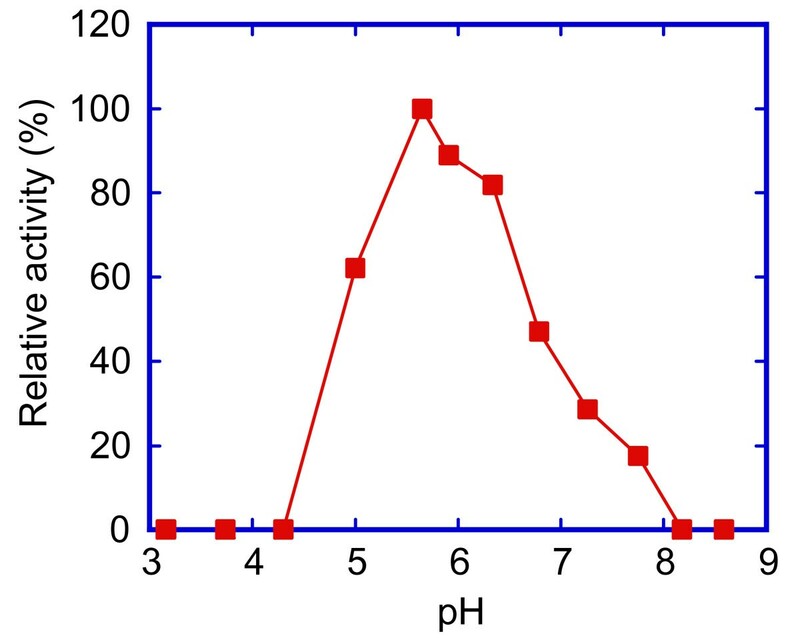 The optimum pH of recombinant protein was observed to be 5.7 (Fig. 3). The characterization is similar to other β-FFase from bifidobacteria  that enzyme reaction proceeds strongly at acidulant condition. The recombinant protein was stable in the pH range from 5.0 to 8.6 (residual activity more than 90%) (Fig. 4). Although this extend of pH-stability is slightly different from the native enzyme , it is not poles apart. The enzyme was stable up to 50°C (residual activity more than 90%), and inactivated at 60°C (Fig. 5). This property is also similar to other bifidobacterium β-FFase . pH Activity curve of recombinant β-FFase. Enzyme solutions were incubated at 37°C for 10 min in McIlvaine buffer with different pHs (3.16, 3.74, 4.30, 5.00, 5.65, 5.91, 6.34, 6.79, 7.26, 7.75, 8.18 or 8.59). The reaction was stopped by adding 900 μl of 150 mM NaOH, and then, relative activities were measured. Relative activities indicated closed squares. pH Stability curve of recombinant β-FFase. After preincubation of enzyme solutions containing 0.1% BSA in Britton- Robinson buffer with different pHs (3.95, 4.25, 4.53, 4.97, 5.67, 6.30, 6.58, 6.89, 7.23, 7.60, 7.92, 8.28, 8.64, 9.13 or 9.53) for 20 h at 4°C, the mixture was adjusted to pH 5.7, and then, residual activities were measured. Residual activities indicated closed squares. Temperature stability curve of recombinant β-FFase. Enzyme solution containing 0.1% BSA was incubated at different temperature (4, 30, 40, 45, 50, 55, 60 or 65°C) for 15 min, cooled to 0°C, and then, residual activities were measured. Residual activities indicated closed squares. The hydrolase activity of the enzyme was not inhibited by MgCl2, FeCl3, CoCl2, MnCl2, SnCl2 and CaCl2, deoxycholic acid sodium salt, TritonX-100, Tween80 and ZnCl2 had enhanced the enzyme activity. The enzyme activity was strongly inhibited by AgNO3, SDS, HgCl2, and was partially inhibited by CuSO4. The result was summarized in Table 2. They formed mercaptides with free SH groups, so inhibited the hydrolysis of 1-kestose, as described previously . Effects of various metal salts or chemical reagents on recombinant β-FFase. A reaction mixture containing 25 μl of enzyme solution, 25 μl of 0.2 M sodium phosphate buffer (pH 5.7), 10 μl of each chemical (10 mM), 15 μl of Milli-Q water and 25 μl of 40 mM 1-kestose was incubated at 37°C for 10 min. To examine the substrate specificity of the recombinant β-FFase, the enzyme was incubated in 10 mM fructo-oligosaccharides such as 1-kestose, neokestose, nystose or fructosylnystose at 37°C for 0, 10 min, 1 and 4 h. Reaction products were analyzed by HPAEC (Fig. 6). This enzyme catalyzed hydrolytic reaction on the fructo-oligosaccharides. In the reaction of 1-kestose and neokestose, fructose and sucrose were produced (Fig. 6(a) and 6(b)). These results indicate that the enzyme hydrolyzed not only terminal β-2,1 fructoside bond of 1-kestose, but also β-2,6 fructoside bond (fru-2,6-glc) of neokestose. When the enzyme was incubated with nystose, fructose and 1-kestose were produced (Fig. 6(c)), with fructosylnystose, fructose and nystose were produced (Fig. 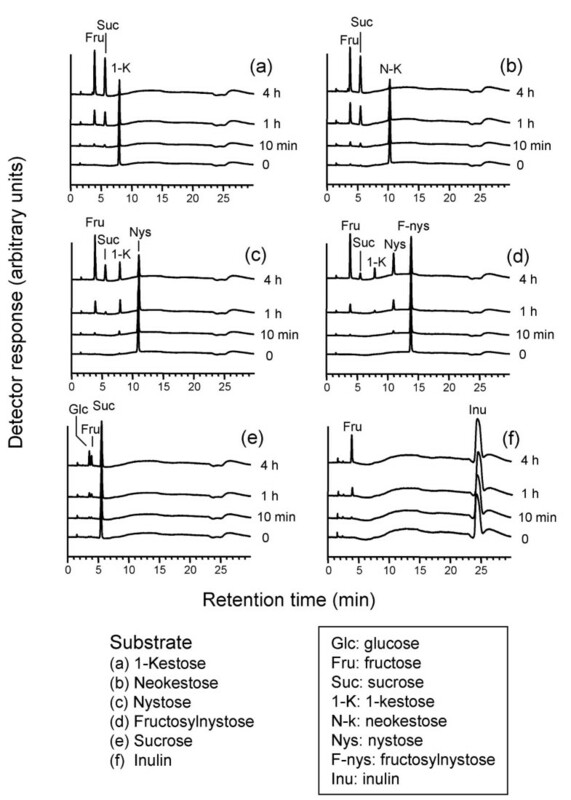 6(d)), with sucrose, glucose and fructose were produced (Fig. 6(e)), with inulin, fructose was produced (Fig. 6(f)). By the prolonged incubation of nystose or fructosylnystose, sucrose and 1-kestose were also produced. This result showed that the enzyme is capable of degrading each substrate via an exo-type of cleavage, releasing terminal fructosyl residues as well as other β-FFase reported from bifidobacteria [14, 15]. To estimate the rate parameters of hydrolysis of several substrates, Michaelis constants (Km) and maximum velocities (Vmax) for each substrate were measured. Km, Vmax, k0, k0/Km are listed in Table 3. These parameters indicated that the recombinant enzyme had high affinity and high rate for hydrolyzing FOS, especially for 1-kestose, neokestose and nystose. The hydrolyzing activity against sucrose and inulin was lower than formers, so the enzyme was thought mainly as relating FOS degradation. High performance anion-exchange chromatograms of the reaction products formed from fructo-oligosaccharide by recombinant β-FFase. Recombinant β-FFase was incubated with 10 mM 1-kestose (a), neokestose (b), nystose (c), fructosylnystose (d), sucrose (e) or inulin (f) for up to 4 h at 37°C. The reaction mixtures were analyzed by high performance anion-exchange chromatography (HPAEC). 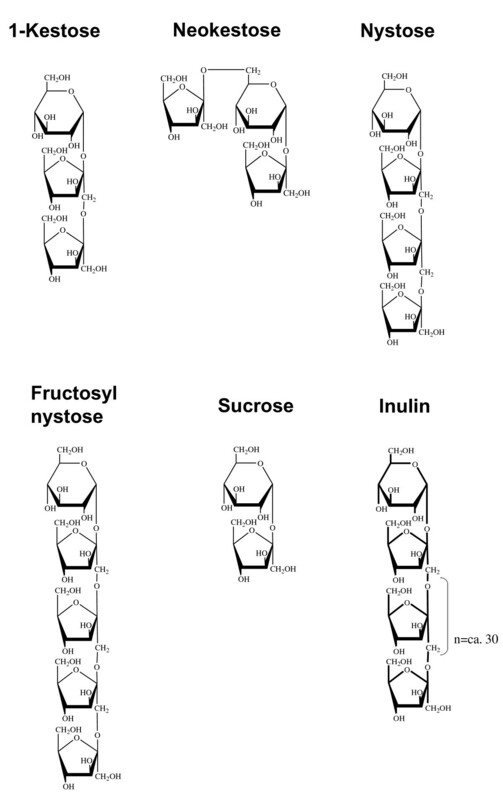 Glc, Glucose; Fru, Fructose; Suc, Sucrose; 1-K, 1-Kestose; N-k, Neokestose; Nys, Nystose; F-nys, Fructosylnystose; Inu, Inulin. Rate parameters of recombinant β-FFase. The recombinant protein indicated a higher relative efficiency for fructo-oligosaccharides such as 1-kestose, neokestose and nystose than sucrose and inulin. The result is in similar to the kinetic parameters from native enzyme . Janer et al reported that recombinant β-FFase from B. lactis (72% identity with amino acid sequence from B. adolescentis G1 β-FFase) showed high affinity to low molecular fructans (Raftilose, DP < 5) compared to low or high polymerized inulin (Raftiline LS or HP) or sucrose . These observations were very similar to our result. Some properties (pH-optima, pH-stability, temperature-stability, effects of various metal salts or chemical reagents) are different between the recombinant and native enzymes, but the characterization are similar each other. We investigated substrate specificity for neokestose in this study, although it was not used in the previous research. Neokestose (β-D-fructofuranosyl (2->6) -α-D-glucopyranosyl-(1<->2)-β-D-fructofuranoside) and its related fructo-oligosaccharides are contained in onion bulbs and asparagus roots. Neokestose and the related saccharides were reported to be synthesized by fructan:fructan 6 G -fructosyltransferase from the vegetables [23, 24]. Recombinant β-FFase from B. adolescentis G1 preferentially hydrolyzed neokestose rather than 1-kestose. The enzyme hydrolyzes not only terminal β-2,1 fructoside bond of 1-kestose or nystose, but also β-2,6 fructoside bond (fru-2-6-glc) of neokestose. The result indicated that neokestose had potentiality to be a good efficient prebiotics, which can promote the human health due to growth of bifidobacteria in the gut. Our result exhibited that the recombinant β-FFase from B. adolescentis G1 had unique properties to hydrolyze preferably low DP fructo-oligosaccharides as well as native one. We suppose that research about β-FFase efficiently to hydrolyze fructo-oligosaccharides is to be of much help for developing more effective prebiotics, probiotics and synbiotics. In this article, cloning the cscA gene from Bifidobacterium adolescentis G1 and characterization of the recombinant protein of cscA gene expressed in Escherichia coli were described. Molecular mass of the purified recombinant enzyme was estimated to be about 66,000 by SDS-PAGE and 60,300 by MALDI TOF-MS. The optimum pH of the enzyme was 5.7 and the enzyme was stable at pH 5.0-8.6. The thermostability of the enzyme was up to 50°C. The Km (mM), Vmax (μmol/mg of protein/min/), k0 (sec-1) and k0/Km (mM-1 sec-1) for 1-kestose, neokestose, nystose, fructosylnysotse, sucrose and inulin were 1.7, 107, 107.5, 63.2, and 1.7, 142, 142.7, 83.9, and 3.9, 152, 152.8, 39.2, and 2.2, 75, 75.4, 34.3, and 38, 79, 79.4, 2.1, and 25.9, 77, 77.4, 3.0, respectively. The hydrolytic activity was strongly inhibited by AgNO3, SDS, HgCl2. The recombinant enzyme had similar specificity to the native enzyme, high affinity for 1-kestose, and low affinity for sucrose and inulin, although properties of the recombinant enzyme showed slight difference from those of the native one previously described. B. adolescentis G1 was cultured in GAM broth (Nissui Pharmaceutical Co., Ltd, Tokyo, Japan), and then, it was used for the extraction of genomic DNA. Escherichia coli DH5α was used as host cell with the plasmid pGEM-T vector (Promega, Madison, WI, USA) for cloning and sequencing. Escherichia coli Rosetta2 (DE3) (Novagen, Madison, WI, USA) was used as host cell with the plasmid pET-32b (+) vector (Novagen) for protein expression. E. coli strains were grown in Luria Bertani (LB) medium supplemented with 100 μg/ml carbenicillin. N-terminal sequences of β-FFase purified from Bifidobacterium adolescentis G1 was determined by ABI 477A protein sequencer/120A PTH analyzer system. After grown B. adolescentis G1 in GAM broth, the cells were collected by centrifugation (1,700 × g, 10 min, 4°C) and the supernatant was removed, the precipitate was resuspended by adding 20 mM Tris-HCl buffer (pH 8.0), and centrifugated (1,700 × g, 10 min, 4°C). Genomic DNA was extracted from the precipitate by DNeasy Tissue Kit (Qiagen, Courtaboueuf, France). Based on cscA gene encoding β-FFase from Bifidobacterium adolescentis ATCC 15703 [accession no. AP009256, protein ID BAF39931], a 1,659 bp of DNA including cscA gene from B. adolescentis G1 was amplified by PCR using B. adolescentis G1 genomic DNA as a template and using G1FFase1-for (5'-CCCAACAATTCATAACCCAG-3') and G1FFase2-rev (5'-TTCCCATATACCCCTTGCTA-3') as primers. PCR condition was: initial step of denaturation by 94°C for 2 min, followed by 30 cycles of 94°C for 15 sec, 57°C for 30 sec and 68°C for 90 sec, and then a final step at 68°C for 10 min using of KOD-plus- (Toyobo, Osaka, Japan). After adenine was attached to the PCR products by A addition kit (Qiagen), these products were ligated into pGEM-T vector using T4 DNA ligase (Promega) and E. coli DH5α was transformed by the resulting vector. The transformants were grown and harvested, and the plasmids were isolated by Sigma GenElute Plasmid Mini-Prep Kit (Sigma-Aldrich, St. Louis, MO, USA), and its insert DNA was sequenced. The plasmid was named pGEM-G1cscA. For construction of expression vector, cscA gene was amplified by PCR using pGEM-G1cscA as a template. Primers used were ffaseNtEcoRI-for (5'-TCCGAATTCGATGACTGGCTTTACTCCGGA-3') and ffaseCtXhoI-rev (5'-TTGCTCGAGTTCCAGTCCGATGGACTTCAT-3'). These primers had recognition sequence of EcoRI and XhoI, respectively. PCR condition was: initial step of denaturation by 94°C for 2 min, followed by 30 cycles of 94°C for 15 sec, 57°C for 30 sec and 68°C for 60 sec, and then a final step at 68°C for 7 min using of KOD-plus-. The PCR product was digested with EcoRI and XhoI, followed by ligation into pET-32b (+) vector cleaved with the same restriction enzyme using Quick T4 DNA ligase (New England Biolabs, Inc., Ipswich, MA). Finally, E. coli Rosetta2 (DE3) was transformed by the ligated pET vector. Resulting plasmid was named pET-G1cscA. The nucleotide sequence of the plasmid was analyzed by ABI 3730 × l sequencer (Applied Biosystems, Foster City,. CA, USA), and confirmed it had no error. The transformants were selected on LB agar plates containing 100 μg/ml carbenicillin. A single colony of transformant was inoculated into 26 ml LB broth containing 100 μg/ml carbenicillin and grown in a shaking incubator at 37°C until the cell density at 600 nm reached 0.4. By adding 1 mM isopropyl-β-D-thiogalactopyranoside (IPTG), and then, incubated for an additional 3 h, recombinant protein was induced. The cells were harvested by centrifugation (10,000 × g, 5 min, 4°C) and washed twice with 20 mM Tris-HCl. Finally, the cells were harvested by centrifugation (5,000 × g, 5 min, 4°C), and stored at -80°C until the preparation of the crude enzyme. All operations were done at 4°C. The cells were suspended in 8 ml wash buffer (50 mM NaH2PO4, 0.3 M NaCl, pH 7.5) containing protease inhibitor cocktail EDTA-free (Roche Molecular Biochemicals, Mannheim Germany), and the suspension was disrupted by ultrasonication. Supernatant after centrifugation (12,000 × g, 5 min) was used as the crude extract. The recombinant protein was purified from the crude extract by His-tag affinity resin (TALON CellThru Resin, Takara-Bio, Kyoto, Japan) according to the manufacturer's instructions. The active fraction was dialyzed for 1 day against the 10 mM sodium phosphate buffer (pH 7.5). To remove the His-tag peptides from recombinant protein in the purified fraction, recombinant enterokinase (rEK, Novagen) was used according to the manufacturer's instructions. The treated fraction was dialyzed for 1 day against the 10 mM sodium phosphate buffer (pH 7.5). This dialyzate was applied to a column (ϕ 1.7 cm × 20.2 cm) of DEAE-Sepharose CL-6B (GE Healthcare, Milwaukee, WI, USA) equilibrated with the same buffer. The adsorbed proteins were eluted with a linear gradient of sodium chloride from 0 to 1.0 M in the same buffer at the flow rate of 30 ml/h. 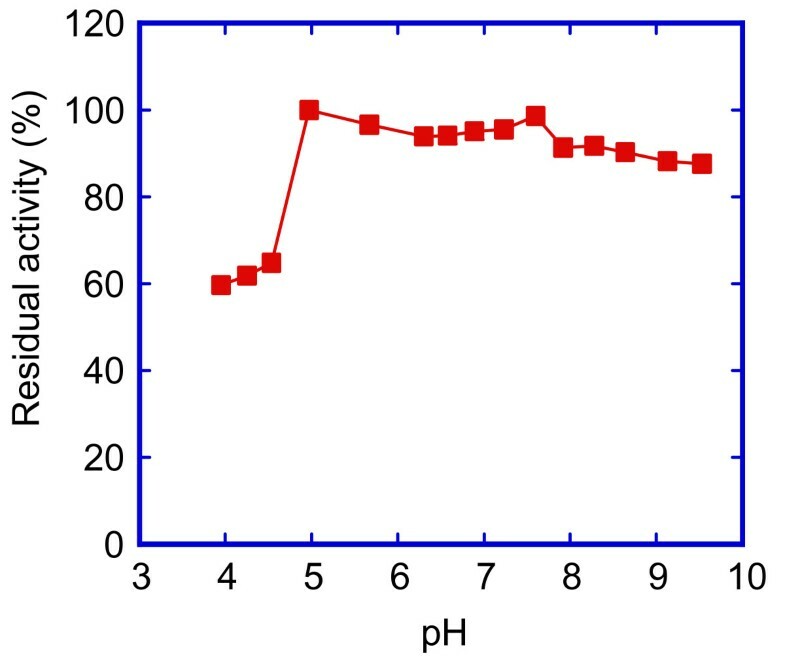 The active fraction was dialyzed against 50 mM sodium phosphate buffer containing 0.1 M NaCl (pH 7.5) for 1 day, and the dialyzate was concentrated by ultrafiltration with Vivaspin 20 (30,000 MWCO, Sartorius, Germany). The ultrafiltrate was filtered on a column (ϕ 2.4 cm × 67 cm) of Toyopearl HW-55S (Tosoh Co. Ltd, Tokyo, Japan) equilibrated with 50 mM sodium phosphate buffer containing 0.1 M NaCl (pH 7.5) at the flow rate of 30 ml/h. The active fraction was used as the purified enzyme solution. SDS-PAGE was conducted on a 12.5% (v/w) polyacrylamide gel by the method of Laemmli . Proteins in the gel were stained with Coomassie Brilliant Blue R-250. LMW Marker (GE Healthcare) was used as molecular mass marker. The concentration of protein was spectrophotometrically measured at 280 nm. MALDI TOF-MS spectra were measured using a Shimadzu-Kratos mass spectrometer (KOMPACT Probe) in positive ion mode with 10 mg sinapic acid dissolved in 600 μl trifluoroacetic acid and 400 μl acetonitrile as a matrix. Ions were formed by a pulsed UV laser beam (nitrogen laser, 337 nm). Calibration was done using bovine serum albumin (BSA) as an external standard. For the measurement of β-FFase activity, 50 μl of 20 mM 1-kestose in distilled water was mixed with 25 μl of 0.2 M sodium phosphate buffer (pH 5.7) and 25 μl of purified enzyme solution and incubated at 37°C for 10 min. The reaction was stopped by boiling for 5 min. One unit of β-FFase activity was defined as the amount of enzyme which produced 1 μmol of fructose per min under the above reaction conditions. For quantification of fructose, high performance anion exchange chromatography (HPAEC) was done on a DX300 chromatograph (Dionex Corp., Sunnyvale, USA) with a CarboPac PA-1 anion exchange column (Dionex Corp.) and a pulsed amperometric detector (PAD) as described previously . For the determination of optimum pH, McIlvaine buffer with pH range 3.0-8.5 were used. The reaction was stopped by adding 900 μl of 150 mM NaOH. To investigate the pH stability of enzyme, the mixture of 25 μl of Britton- Robinson buffer with pH range 3.0-10.0 and 25 μl of purified enzyme solution containing 0.1% BSA was kept at 4°C for 20 h, then the mixture was adjusted to pH 5.7, and incubated with 10 mM 1-kestose at 37°C for 10 min. The reaction was stopped by heating the samples at 100°C for 5 min. For temperature stability profiles, 25 μl of 0.2 M sodium phosphate buffer (pH 5.7) and 25 μl of purified enzyme solution containing 0.1% BSA were mixed, and they were incubated at 4, 30, 40, 45, 50, 55, 60 and 65°C for 15 min, respectively, and then, each solution was cooled to 0°C. The mixtures were incubated with 50 μl of 20 mM 1-kestose at 37°C for 10 min. The reaction was stopped by heating the samples at 100°C for 5 min. The effects of metal salts and chemical reagents on the enzyme activity were investigated. The reaction mixture, 25 μl of 40 mM 1-kestose, 25 μl of 0.2 M sodium phosphate buffer (pH 5.7), 10 μl of each metal salt or chemical reagents, 15 μl of distilled water and 25 μl purified enzyme was incubated at 37°C for 10 min. The reaction was stopped by boiling for 5 min. To measure rate parameters of hydrolysis against different substrates, a reaction mixture containing 50 μl of each substrate at various concentrations, 25 μl of 0.2 M sodium phosphate buffer (pH 5.7) and 25 μl of enzyme solution was incubated at 37°C for 10 min. Molecular activities (k0) were calculated by using maximum velocities (Vmax) and relative molecular mass of the enzyme. Saccharides as substrates were prepared as follows. Crystalline 1-kestose [1F-β-D-fructofuranosylsucrose, 1-kestotriose] and nystose [1F(1-β-D-fructofuranosyl)2 sucrose, 1, 1-kestotetraose] were prepared from sucrose using Scopulariopsis brevicaulis β-FFase . Fructosylnystose [1F(1-β-D-fructofuranosyl)3 sucrose, 1, 1, 1-kestopentaose] was prepared from Jerusalem artichoke tubers in our laboratory. Sucrose and inulin were purchased from Wako (Wako Pure Chemicals Industries, Osaka, Japan). Neokestose was prepared from asparagus roots as described previously . The structures of the substrates were shown (Fig. 7). Chemical structure of saccharides. The structures of the substrates used in the study are shown. TO and KU collected data of gene sequences and recombinant protein, and contributed to drafting the manuscript. KM and MK collected data of native enzyme from bifidobacteria. NS and SO generated study design and drafted manuscript. All authors read and approved the final manuscript.